First, let me apologize for my lack of posting the last few days -- I've been sidetracked on some urgent family issues which I had to attend to. But now I should again have time to post more. The news this week that Steve Rosen and Keith Weissman, the two senior AIPAC staffers who are in legal jeopardy as a result of the FBI investigation, aren't willing to take the fall is definitely not the outcome that AIPAC wanted. The immediate issues of illegal receipt of classified information, possibile espionage, and failure to register under the Foreign Agents Registration Act (FARA) are bad enough, but the larger issue is the exposure of AIPAC's operating methods. The FBI has a couple of years' worth of wiretap evidence, and the information initially leaked to Rosen and Weissman by Larry Franklin was linked to the push for war with Iran (a rather timely issue, to say the least). The Israel lobby knows good and well that if the transcripts of their conversations with Capitol Hill staff get publicized by way of a trial, they are going to be a lot less effective. Their power has rested on being able to promote Israel's interests (as they see them) away from public view -- i.e. they didn't have a position on the Iraq War resolution, but everyone in Washington of any degree of political sophistication knew that they were making an "unofficial" effort to secure its passage. If most Americans knew the extent of this sort of "hush hush" political arm twisting, and the damage it does to American interests, there would be a movement to counterbalance AIPAC, particularly now that a clear majority of Amercians believe the Iraq War was a mistake, and have an interest in knowing who was responsible for misleading us into it. So anyway, a trial is a good outcome for those of us who want to see a national debate about this. AIPAC is clearly trying to distance itself from Rosen and Weissman, and will be making the "couple of bad apples" defense of the organization, but it isn't likely to work. Steve Rosen was one of the key players in AIPAC over the last 24 years, not just another employee. Frankly, I don't care so much about the outcome of the trial -- it may be the case that they're about to make an entrapment defense which will stick (though I don't think that's the most likely outcome). What is important is the exposure of AIPAC's influence and operating methods. Once the American people see AIPAC's operations unveiled, there is going to be a lot more public debate about whether the U.S. is being forced to sacrifice our own interests for those of the Israeli Right. Of course, the most important unanswered question is -- will this happen in time to help derail the sales pitch for war with Iran? WASHINGTON — A recent FBI interrogation of an Israeli defense expert may indicate that the Justice Department's investigation into the contacts between America's pro-Israel lobby and a Pentagon analyst is broader in scope than previously believed. The expert, Uzi Arad, head of the Institute for Policy and Strategy at Israel's Interdisciplinary Center Herzliya, said that two months ago FBI agents interviewed him about his contacts with the Pentagon Iran specialist, Larry Franklin. During the hour-long interview, he said, the FBI agents brought up the name of an American Jewish Committee official, Eran Lerman, who is a former senior official in Israeli military intelligence. Franklin was arrested and charged Wednesday with "disclosing classified information related to potential attacks upon U.S. forces in Iraq to individuals not entitled to receive the information." The Justice Department did not name the individuals who allegedly received the classified information from Franklin, but media reports claim they are Steven Rosen and Keith Weissman, two former officials at the American Israel Public Affairs Committee who were recently dismissed by the pro-Israel lobbying organization. Arad's comments, an unusual disclosure of a small wrinkle in the otherwise ultrasecretive FBI investigation, may suggest that the FBI is investigating more than the alleged unlawful contacts between Franklin and Aipac officials. Franklin is the first person to be indicted in the FBI investigation. Rosen and Weissman have not been charged. Initially, press reports said that Rosen and Weissman's alleged transfer of secret information by Israeli diplomats was the focus of the investigation. The questioning of Arad may confirm speculation by some in the Jewish community that the investigation is related to a larger inquiry into Israeli or pro-Israeli attempts to influence America's security establishment and its policy in the Middle East. Arad said the FBI agents asked him, among other things, why he had sent to Franklin, less than a year ago, a research paper by Lerman on ways to re-energize America's relationship with Israel. "They asked me who was Eran Lerman, although they clearly knew who he was," Arad told the Forward in a telephone interview. Arad was a policy adviser to former Israeli prime minister Benjamin Netanyahu and once headed the research department of Israel's Mossad intelligence service. Lerman joined the staff of the AJCommittee in 2001. Kenneth Bandler, a spokesman for the AJCommittee, said he had no comment on the FBI's questioning regarding Lerman. Arad said that his strategic policy institute had commissioned Lerman to write the paper. He said that he did not remember sending the article to Franklin but that the FBI investigators showed him a letter that accompanied the article, carrying his signature. Arad said he explained to the investigators that this was a mechanized signature on an information package sent en masse to a mailing list of several hundred former participants in the Interdisciplinary Center's annual strategic-affairs conference, commonly known as the Herzliya Conference. 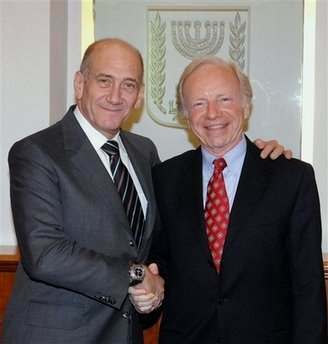 Franklin attended the December 2003 Herzliya Conference, though he did not deliver an address. In his paper, Lerman wrote that the once-dynamic U.S.-Israel strategic relationship had fallen into a "maintenance mode" in recent years and ought to be re-energized for the benefit of both countries. At the December 2004 Herzliya Conference, Lerman delivered an address based on his research paper. Arad said the FBI agents asked him about his conversations with Franklin at the conference and several months later at a meeting between the two in the Pentagon cafeteria. He also said that both conversations were brief and that he could hardly remember their content. The FBI interview was also brief, as well, he noted. It was arranged in haste, as Arad was rushing to catch a plane from New York to Israel, and took place in a car while he on his way to the airport. This week, Franklin handed himself in, and was scheduled to make an initial appearance at a Northern Virginia court by press time. In a statement, the Department of Justice said that Franklin, 58, surrendered to authorities at the FBI's Washington Field Office following the filing of a criminal complaint Tuesday and the unsealing Wednesday of the indictment against him. The statement notes that the violation Franklin is charged with carries a maximum penalty of 10 years in prison. Defense, where he served as an Iran desk officer, to a less sensitive position in the Pentagon. The criminal complaint filed in the U.S. District Court for the Eastern District of Virginia, alleges that on June 26, 2003, Franklin had lunch at a restaurant in Arlington, Va., with two individuals, identified as "U.S. Person 1" and "U.S. Person 2." At the lunch, according to the Justice Department, Franklin disclosed classified information that has been designated "Top Secret" and related to potential attacks upon American forces in Iraq. The government claims that neither of Franklin's lunch companions has the security clearance to receive the information. Allegedly Franklin told the two individuals that the information was "highly classified" and asked them not to "use" it, according to the Justice Department statement. This portion of the Justice Department statement implies that Franklin's lunch companions — alleged in press reports to have been Rosen and Weissman — knew that they were handling information from a highly sensitive document. According to press reports, the FBI is investigating claims that after the lunch the two former Aipac officials transferred the secret information to an Israeli diplomat in Washington. The Justice Department statement says that a search of Franklin's Pentagon office in June 2004 found the June 2003 classified document containing the information that Franklin allegedly disclosed to the two individuals. The criminal complaint against Franklin also alleges that on other occasions he disclosed, without authorization, classified American government information to a foreign official and to members of the news media. In addition, according to the Justice Department statement, about 83 separate classified American government documents were found during a search of Franklin's West Virginia home in June 2004, most of them classified as top secret or secret. The dates of these documents spanned three decades. The investigation into this matter is continuing, the Justice Department stated. • According to an FBI affidavit that accompanies the charges, Franklin admitted during an FBI interrogation in June 2004 that he provided the information contained in the secret document to the two individuals. • The information that Franklin is charged with disclosing is related not to Iran — contrary to previous reports — but to "potential attacks upon U.S. forces in Iraq." The government's main concern, according to the FBI affidavit, is that such information could be used to harm the United States by "a country's discovery of our intelligence sources and methods." • Contrary to previous media reports, charges against Franklin do not allege the transfer of a secret document. Instead it is charged that he "verbally disclosed" information that "was contained" in a top-secret document. The distinction is important, legal experts say, because verbally transferring such information is a less serious offense. • The document in question, according to the affidavit, was marked "on the first and last pages with a caption in all capital letters," which identified it as "TOP SECRET with a denomination of its SCI [Sensitive Compartment Information] status" — the highest security classification. I thought it might be interesting to put together a timeline of events concerning the arrest of Lawrence Franklin and compare it to when certain Neocons like Feith, Wurmser, Luti, etc. either decided to leave or were shuffled around, and out of the DoD. By just poking around on the net, I found a lot more than I bargained for! Forgive me if this has been explored before, but, personally, I had no idea that the people uor country has been trusting with top secret intelligence information have had a history of violating that trust. That is why I think the arrest of Franklin may be a sign of bigger things to come. Below is the timeline I pieced together. * = new update! June 2001 - Rhode meets with Ghorbanifar in Paris and discusses regime change in Iran. He had been introduced to Ghorbanifar by Ledeen, who had maintained his ties with him. (http://msnbc.msn.com/Default.aspx?id=3706341&p1=0). Early 2002 - Wolfowitz and Feith create an Iraq war-planning unit in the Pentagon's Near East and South Asia Affairs section, run by Deputy Undersecretary of Defense William Luti, under the rubric "Office of Special Plans" (OSP), into which the Wurmser-Maloof intelligence unit is folded. Luti had come to DoD by way of Cheney's office. Wurmser becomes senior adviser to Undersecretary of State John Bolton, who was in charge of the State Department's disarmament, proliferation, and WMD office and was actively promoting the Iraq war at State. OSP begins a relationship with Ahmed Chalabi, from whom they receive intelligence. (http://www.globalexchange.org/countries/mideast/iraq/1448.html). Rhode also serves as a liaison between the Defense Department and Ahmad Chalabi. (http://www.thenation.com/doc.mhtml?i=20040412&s=dreyfuss). June 30, 2003 - FBI find the document Franklin disclosed in his office, pursuant to warrant, and Franklin admits his guilt in an interview. FBI search Franklin's home and find 83 documents of various levels of classification being held illegally. Franklin is stripped of his security clearance. (http://news.findlaw.com/cnn/docs/dod/usfrnkln50305cmp.pdf). January-February 2005 - Several of the above four top AIPAC staffers testify before a federal grand jury convened by U.S. Attorney Paul McNulty. (http://www.jpost.com/servlet/Satellite?pagename=JPost/JPArticle/ShowFull&cid=1111807178234&a page=1). AIPAC places Rosen and Weissman on paid leave and Franklin is quietly rehired at the Pentagon, against the FBI's wishes, in a non-sensitive position. (http://www.jewishtimes.com/News/4683.stm). * February 8, 2005: A "team" that includes CIA search the documents of Sen. "Scoop" Jackson stored at the University of Washington, reportedly to remove any classified materials. (http://seattletimes.nwsource.com/html/localnews/2002172910_jacksonpapers07m.html) Besides Perle, Feith is a former Jackson staff member (http://www.dailykos.com/story/2005/2/15/201851/101) (Thanks to Miss Devore and the Kos diary of Thistime) March 7, 2005 - Bolton nominated to be next UN Ambassador. (http://www.cnn.com/2005/US/03/07/bolton/index.html). "Operating Off a Different Agenda"